Conservation experts Marya Albrecht and Sabrina Meloni from the Mauritshuis examines The Mocking of Samson from the collection of the Royal Museum of Fine Arts Antwerp. © Mauritshuis, The Hague. Photographer: Ivo Hoekstra. Edgar Degas, Dance Examination (Examen de Danse, 1880. Pastel on paper; 24-1/2 x 18 in. Denver Art Museum: anonymous gift, 1941.6. Organized with the Estate of Günther Förg, this new exhibition at Almine Rech Gallery in London follows the artists reflexive principles. “Sisters” by Jenness Cortez ©2018. Acrylic on Mahogany panel, 24 by 20 inches. Renato Fratini, The Snake, c. 1967 (detail). Gouache on board. © Lever Gallery. The Hermitage Museum announced four highlights from its exhibition schedule opening in the first half of 2018. Hans Hofmann, Heraldic Call, 1962, Oil and ducco on canvas , 60 1/4 x 48 3/8 in (153 x 122.9 cm), Courtesy of the University of California, Berkeley Art Museum and Pacific Film Archive, Gift of Hans Hofmann, 1965.17, © 2017 Estate of Hans Hofmann/ARS (Artists Rights Society), New York, NY. Gloria Stoll Karn, Square Dancers, c. 1941. Oil on board, 24 x 20. Cover illustration for Rangeland Romances, February 1947. ©Gloria Stoll Karn. All rights reserved. Song Dong, Through the Wall (2016). Collection museum Voorlinden, Wassenaar. Photo: Dawn Blackman, courtesy Pace Gallery. Axel Kasseböhmer, Stoff I, 1981. Oil on canvas, 206 x 232 cm © Axel Kasseböhmer. Courtesy Sprüth Magers. Maria Martinez-Cañas, SI_031, 2017. Pigment print, 20 x 16". Edition of 3. Camillo Innocenti (Trieste 1871  Rome 1961), The man with the dogs. Oil on cm 108 x 105 canvas, signed (Innocenti) and located (Roma) lower left © Ottocento Art Gallery. April 21, 1990. Romain de Tirtoff (23 November 1892 - 21 April 1990) was a Russian-born French artist and designer known by the pseudonym Erté, from the French pronunciation of his initials. 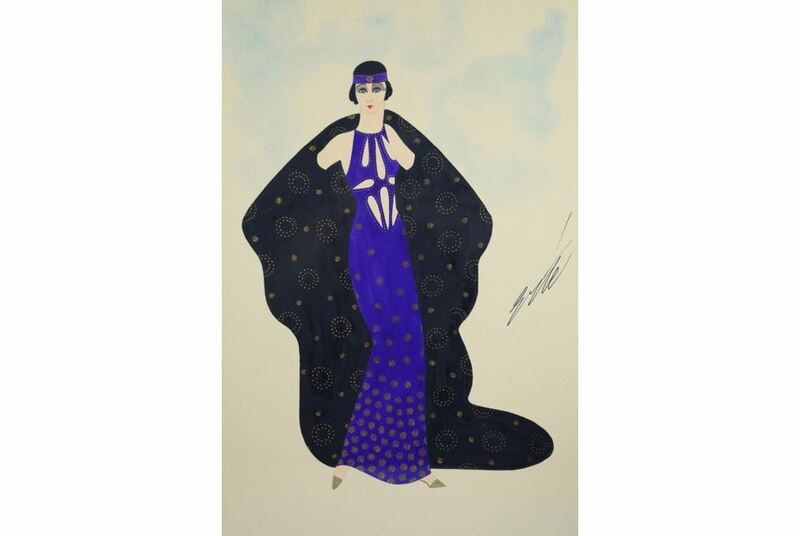 He was a diversely talented 20th-century artist and designer who flourished in an array of fields, including fashion, jewellery, graphic arts, costume and set design for film, theatre, and opera, and interior decor.